Meet our new favorite pizza. Swap tomato sauce for spicy chili sauce. 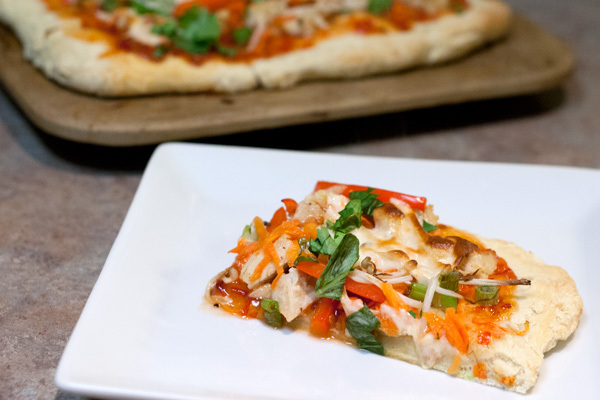 Replace pepperoni and mushrooms with chicken, carrots, and bean sprouts. Sprinkle with cilantro and basil. And finish with a handful of crushed peanuts. Bright, fresh, flavorful. Just in time for Spring. Makes 1 rectangular pizza or 2 round pizzas..
For pizza dough: Dissolve the active dry yeast + a pinch of sugar in 2 tablespoons of the lukewarm water. Let it sit at room temperature for 15 minutes, until the mixture has bubbled and expanded. Combine dissolved yeast with the remaining ingredients in the bowl of a stand mixer. Mix at low speed for 4 to 5 minutes. Place the dough in a lightly greased bowl, cover, and allow it to rise until it’s puffy, about 90 minutes. Drizzle olive oil into the bottom of the pan you plan to use for the pizza. Place the dough in the prepared pan, pressing it over the bottom and stretching it towards the edges. Cover the dough, and let it sit for 15 minutes. For spicy chili sauce: Bring chili-garlic sauce, 1/4 cup water, vinegar, sugar, and salt to a boil; simmer for about 3 minutes. In a separate bowl, mix the cornstarch into 2 tablespoons of water. Add cornstarch to the sauce on the stovetop; simmer until it thickens, about 3 minutes. For pizza: Spread the spicy chili sauce over the pizza dough. Add the chicken, peppers, carrots, bean sprouts, green onions, and cheese. Bake in a preheated oven until golden brown on top, about 6-10 minutes. 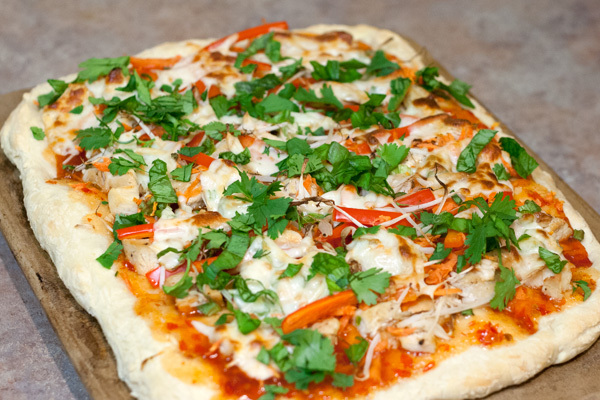 Sprinkle the peanuts, basil, and cilantro on top of hot pizza. Serve. This is definitely a pizza that I have been wanting to make for a while. Your version looks delicious! I think Christopher will want to eat this daily! This looks SO delicious!! It will probably be making an appearance on my Menu Monday in the coming weeks!